Walmart and McDonald’s recently have raised wages to $9 an hour or more, substantially higher than the federal minimum wage of $7.25 an hour. 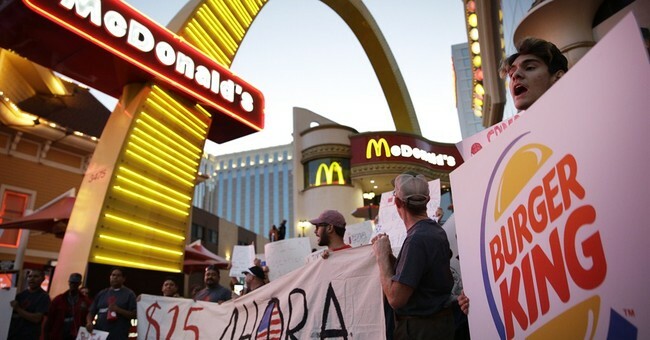 They did so following a highly publicized campaign by protesters to force McDonald’s to increase wages and benefits. Walmart, the notorious cost cutter, was under pressure to raise wages as well. Both companies did so without Congress passing President Obama’s bill to raise the federal minimum wage to $10.10. This story demonstrates that wages can rise without government intervening in the private contracts between employees and firms. Walmart and McDonald’s both raised wages because they had the means to do so. Walmart made $16 billion in the past year from which to pay higher wages. The company’s profit margin of 3.4% was almost double Costco’s profit margin of 2%. McDonald’s does even better. It earned $1.8 billion in profits after taxes in 2014 and has a profit margin of 17%. That’s more than twice what YUM brands produced with its KFC, Taco Bell and Pizza Hut brands. So you can see why McDonald’s was the leader in raising wages. Of course, the marketplace, more than the legislature, forced those companies to raise wages. Competitors were luring away good employees from these companies by offering higher wages. A tightened labor market and higher productivity will do more to raise wages “naturally” than the “artificial” means of government edict. Once students see there are natural, genuine ways to raise wages, they are less likely to vote for artificial means to raise wages.